The long spell of dry weather has caused part of the IJsselmeer lake to become too salty to drink and officials now plan to use tankers bring in water from other parts of the lake to ensure supplies to 60,000 people. Infrastructure minister Cora van Nieuwenhuizen said in a statement that the water is still fit to drink but ‘has a slightly different taste’. The problem is concentrated in Andijk, where a water purification plant is located that supplies 60,000 homes in the part of Noord-Holland known as West Friesland. Efforts to reduce the salt content have not worked and last week’s rainfall has not been sufficient to solve the problem. The only way to make sure people living in West-Friesland have access to good quality tap water is to pump up water from other sites in the IJsselmeer where it is less salty, the minister said. The PWN water board is set to send two tankers to the lake next week where they will pump up water and transport it to Andijk eight times a day. 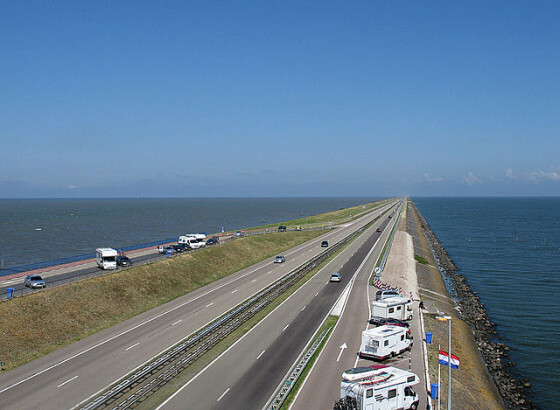 The IJsselmeer is the largest body of fresh water in the Netherlands and formed part of the Zuiderzee until 1932 when it was closed off by the Afsluitdijk.